After Code Central is installed and registered, you can create coverage projects and start collecting data. Code Central can only collect coverage data locally. If the process you want to cover is not on the same machine as Code Central, install Collector on the remote machine and then connect it to your Code Central server. All projects are created and configured in Code Central, then synced to Collector, where most settings are view-only. The local Collector will profile the unit test, executable or service as configured in the Code Central project, gather the coverage data every time your code runs and then automatically send the results to Code Central. You can install Collectors on remote machines by downloading the installer directly from Code Central. Log in into Code Central with a valid username and password, created earlier in Code Central Admin. 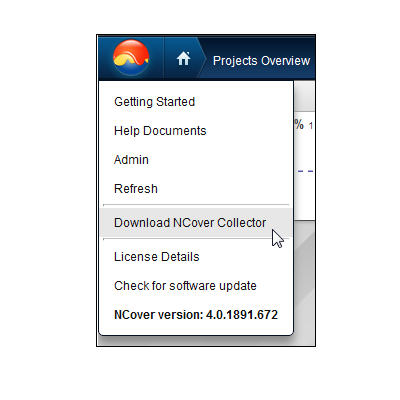 On the main NCover menu, click on Download NCover Collector. Code Central will download the Collector installer to the remote machine. Run the installer and you'll be prompted to connect to Code Central. You can copy the Collector installer from this folder to the remote machine, and then double-click to run the install.